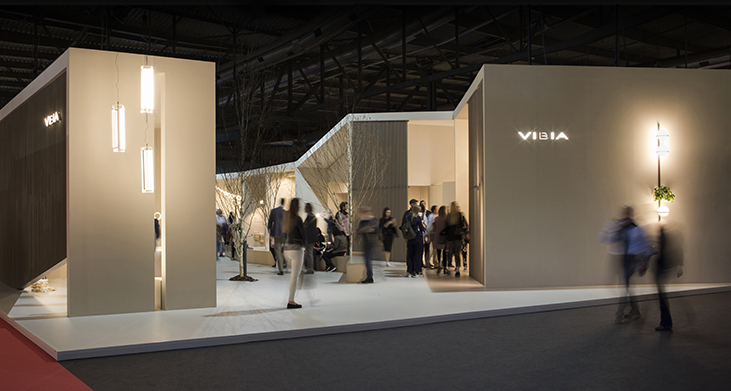 The following video is an overview of the innovative, practical and poetic new lighting typologies that Vibia presented at the most recent edition of Euroluce held between April 4th and 9th in Milan this year. Products like Guise, by Stefan Diez, a collection of lights that transforms its materiality into the medium of the light itself: the outdoor collection June, by Emiliana Design Studio, including suspended and table top lamp versions that provide a versatile lighting feature for summer celebrations: the concave curves of Musa, by Note Design Studio, a collection of wall sconce, table and floor lamps that combine hand blown opal glass and feminine reflective surfaces: a new version of North, by Arik Levy, a hybrid pendant/floor lamp that deconstructs its elements bringing light precisely where it’s required: timeless contemporary classic Palma, by Antoni Arola, that combines hand blown spherical diffusers with metal strap plant holders: and Structural, by Arik Levy, a collection of lights that inhabits the junctions of walls and ceilings in an architectural sculpture. The other collections featured are Tube designed by Ichiro Iwasaki a suspended light fitting composed of screens connected to the ceiling by tubular support structures; and Fine by Maurici Ginés and Victor Vinyamata, a collection of wall lights that creates light and shade effects through its geometric forms; Duo is a collection of ceiling lights by Ramos & Bassols expressed in warm organic forms provided by a wood interior and Tempo by Lievore Altherr a collection of 3 archetypical lamps within a single system that provides combinations of direct and indirect lighting. We invite you to sit back, relax and let our lamps illuminate!